Sometimes you just want a burger, and a decent place to get one on Madison’s far west side is Mooyah. Mooyah is in a strip mall in the parking lot of the Super Target in Fitchburg. The dining room isn’t huge and fills up fast during lunch, but they do have additional outdoor seating during the summer. You order either a single or double Mooyah burger, then you can add cheese, bacon or avocado. But the best part are the extras. You can add anything from lettuce, tomatoes and pickles to grilled onions, fried onion strings or jalapenos. They also have a dozen sauce options. I got lettuce, tomatoes, cheddar, bacon, mushrooms and jalapenos. It was a great custom burger. The one downfall is that with all the extra toppings and the soft buns, the burgers get pretty messy. 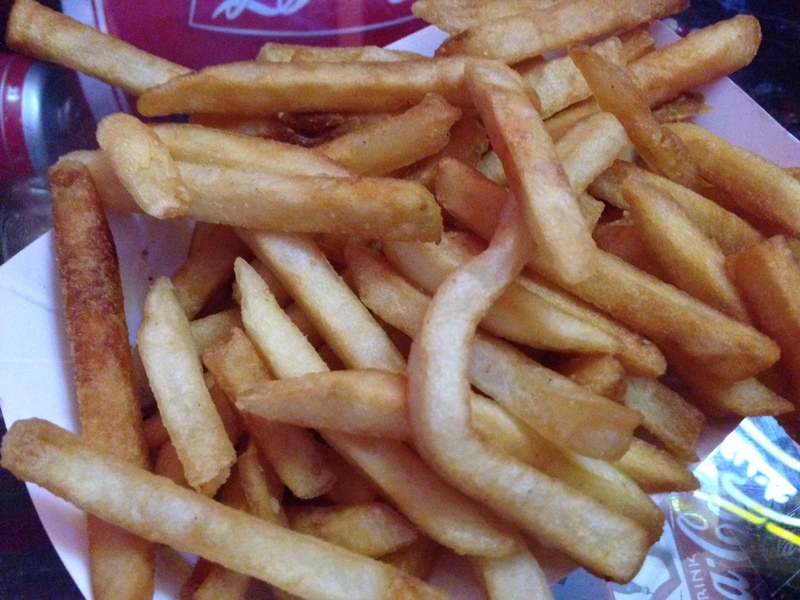 The regular fries are decent, but rumor has it the sweet potato fries are way better. FOOD NOTES: I don’t usually go for burgers and fries, but if you’re looking for a decent burger and fries with a lot of topping options, Mooyah is a good spot. They’re not the greatest burgers you’ll ever find, but they’re on par with Five Guys with the amount of options and tasty fries. The metal lunch trays they’re served on are also pretty fun. I’ve lived in Middleton over four years and the Stamm House has been an empty shell that entire time. That is, until this summer when it opened as a restaurant. The building itself is extremely old and historical, so I can only imagine how bad the inside was, but their remodel doesn’t seem to go with the historical nature of the building. They put up pine panelling on the walls and some of the booths are made of the same panelling. The bar is stark and cold, and the lack of decor doesn’t fit with the warm stone building. We sat outside, which had the best atmosphere. It was simple outdoor seating with a white picket fence and some small lights. Their menu is pretty small, which is good because it means they’re focusing on getting what they’re serving right. We started with a cheese and charcuterie plate that came with three cheese, a liver paste and some tasty pairings. I liked the option of four items for $17 because we could get three cheeses and one meat. That’s also a very reasonable price for the amount of food we got. The options change, so you can probably never build the same cheese/meat board twice. Ours came with pickled veggies, two different types of preserves, nuts and bread. I could make an entire meal out of charcuterie, so this was my favorite part of the meal. I got the sirloin entree, which isn’t on the menu anymore. The sirloin dish I got came with roasted tomatoes, asparagus and onions. It also came with a sweet and savory sauce that I didn’t like. The steak was perfectly cooked, had a great flavor and was tender. The serving of sirloin was also about twice as much as I was expecting. In general, the dish was good, but in true American fashion I wanted a potato. And ironically, the new sirloin dish posted on the Stamm House’s online menu has a potato listed with it. 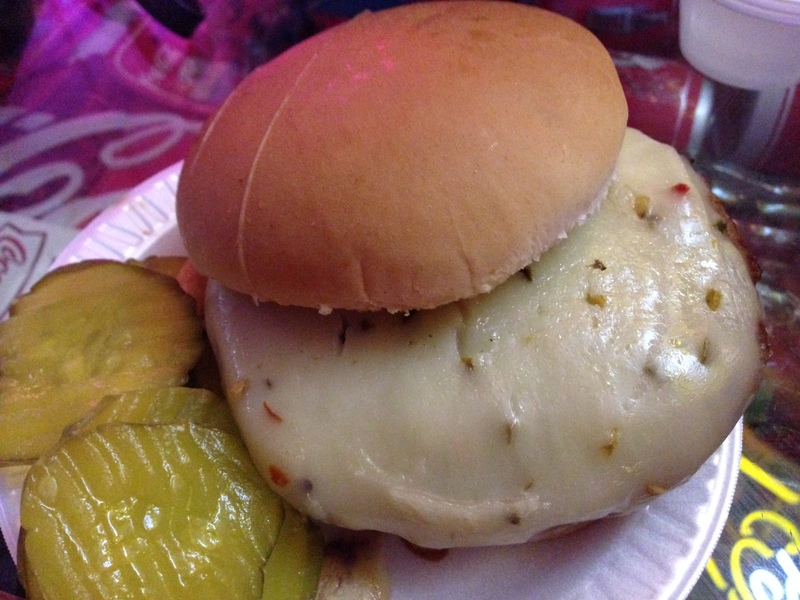 My mom got the burger, which was a standard burger that had one interesting topping — mornay sauce. I love mornay sauce. It’s a creamy, cheesy white sauce that usually accompanies eggs or steak, but putting it on a burger is a great idea. If you’re looking for a good burger that’s a little different than the norm…this is it. The frites and aioli were also top notch. My mom and I aren’t dessert people, but they had French press coffee on the menu and we wanted something sweet to go with it. So we got the set of three pastries. The crispy shells were filled with a not-too-sweet custard and the crunchy hazelnuts were perfect. They were just sweet enough to compliment the strong coffee perfectly, but not too sweet to be overwhelming. FOOD NOTES: I loved the cheese and charcuterie board (because those are hard to get wrong), but my sirloin entree could have been better. Based on the menu changes, I would definitely give the Stamm House another chance because the hardest part — the steak — was the best part of my meal. I was just disappointed with the sauce and vegetables. I love that they offer French press coffee with their perfectly balanced desserts. I don’t love the remodeled inside, but once their outdoor patio opens back up for the summer, I’ll give Stamm House another chance. I think I’ve said this before, but I’m going to say it again — I’m all about the townie bar. I’ve found that you can usually find the best atmospheres, prices, food and people at townie bars. There’s a reason people keep going back to these places and the owners usually don’t make changes very often. 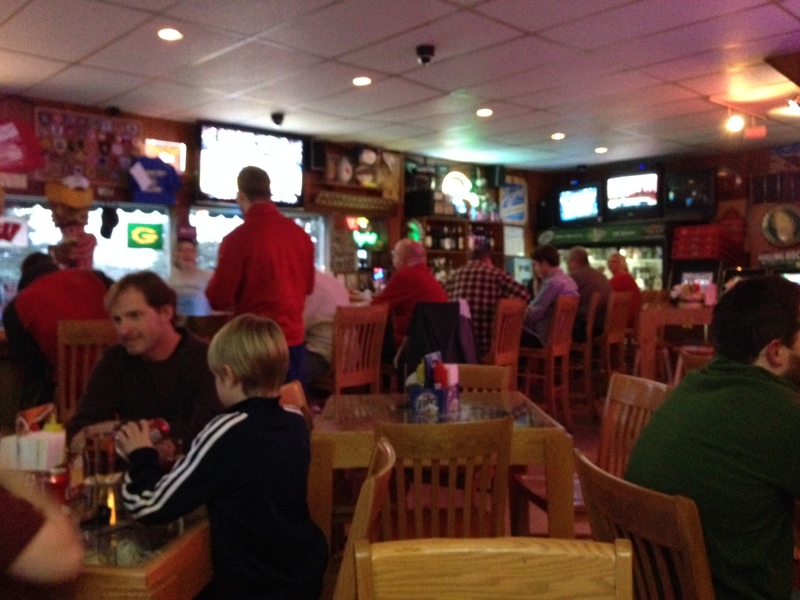 The Village Bar, right where Mineral Point Road veers and changes into Speedway Road, is one of those places. Village Bar – we’re sitting in the front corner so this is about it! When you walk in you’ll notice there are only about a dozen tables and the same number of bar stools. The other thing you’ll notice is that even though they have a food menu there’s no kitchen — they have a small cook top and fryer at the front end of the bar that handles everything. Their menu is pretty simple – hamburgers, cheeseburgers, a sausage and cheese plate (which is about as basic as it can be), fries and chips. The menu also listed steak, pork chops, brats and hotdogs, but I didn’t see anyone get any of those items. Oh yeah, one more thing — everything is served on styrofoam plates. I got the cheeseburger with pepper jack cheese and an order of fries. 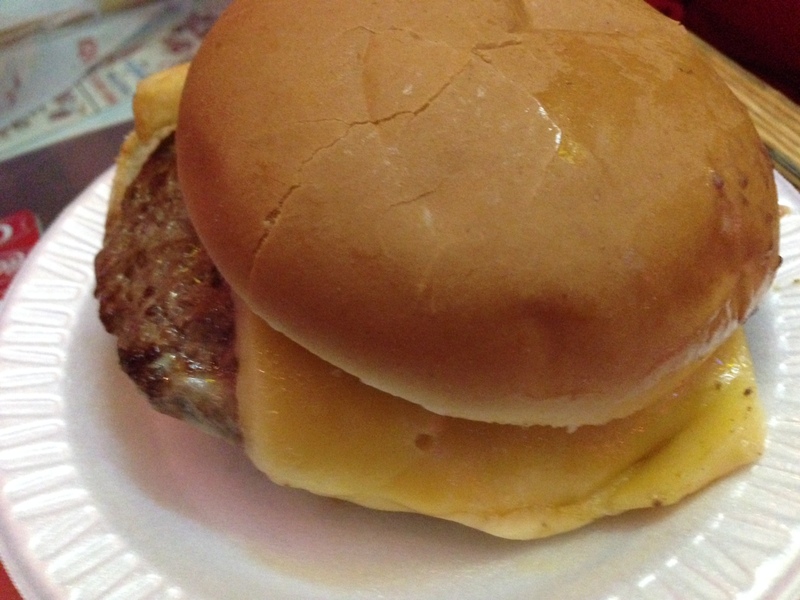 The burger itself was decent — a good size, had a good char — but the bun was pathetic. They steam the bun on the cook top, but I would prefer it to be grilled or toasted or left alone, because what was left was a soggy hunk of bread that was too small and too mushy to do any good. The cheese was a completely different story. I’m not sure how many slices they use, but the cheese was almost as thick as the burger. I really enjoyed the cheese in the beginning – it was melty and thick – but by the end it had congealed a little and the amount seemed unnecessary. But that also could have been caused by the fact that I was chatting too much and not eating fast enough! The fries were decent, but nothing special. 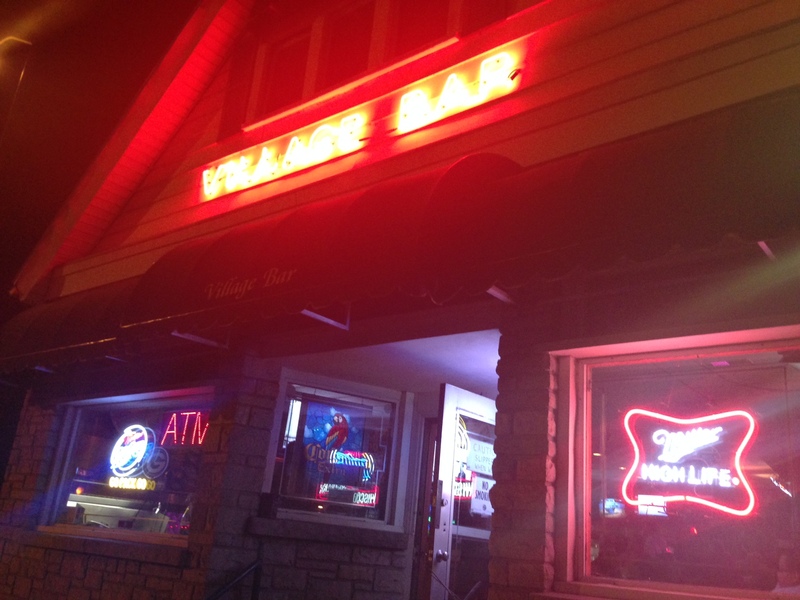 FOOD NOTES: Honestly, I loved the atmosphere at the Village Bar. It was super chill and very Badgers sports focused (I was there to watch my Badgers men’s basketball team squash Coastal Carolina in the first round of the NCAA Tournament, so that was a plus!). Everything on the menu (including beer from what I remember) is under $5, so that’s also something to note. The next time I head to the Village Bar I will probably skip the cheese on my burger and I will definitely get a super old school cheese and sausage plate to enjoy during the game.